on friday, i went to big bear with my mom, brother, and sister-in-law chrystal. 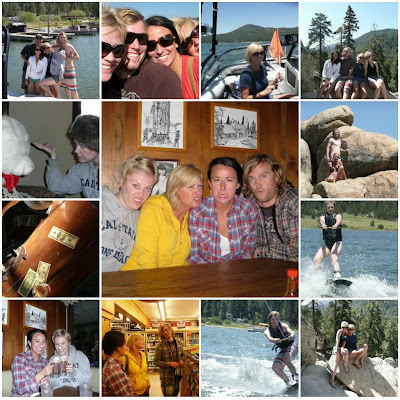 we stayed one night and spent all day saturday on big bear lake frolicking and wakeboarding. i had the most terrific time ever. i've said it before, and i'll say it again, i love my family. i only wish levi and ivy could have joined us. sidenote: if you are ever in the big bear area and would like to go out on a boat or try any watersports, do yourself a favor and contact designated wake sports and ask for chris. see? there he is (a second after this photo was taken, he pushed zachary in - heheehe). he was amazing. super patient, very knowledgeable, easy to talk to, and just an all around good guy. we will definitely be going back to him again in the future. what on earth is farkle? looks so pretty there! it's a dice game. isn't that the best/worst/weirdest name ever?? Looks SO fun! I have never been to Big Bear...one day, for sure! Glad that you had such a good time, though! Enter my photo caption contest! that looks like such a great trip...I love Big Bear, so beautiful! We have a place up in Big Bear. Looks like you all had a great time! We go up several times each year. My favorite time of the year though is summer time. So beautiful.